Have your business noticed in a unique way this summer by advertising with the Honkers! 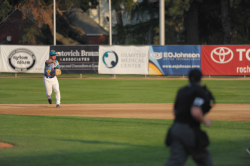 Your business name, logo and telephone number can be seen at every Rochester Honkers home game, all summer long! The ideas are endless. The only thing stopping you may be your imagination. All Billboards are continuously displayed at Mayo Field from approximately May 25 through August 20. 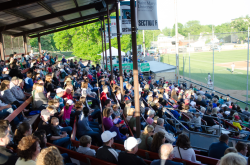 Mayo Field is used nearly every day by many other teams in additional to the Honkers and your Billboard will be visible to all fans that come through the turnstiles. TWO Vertical Foul Pole signs for both the Left and Right Field Foul Poles. Only ONE sponsorship available. Vertical or Horizontal signage attached to the outfield Light Poles. Your signage will be seen high above all other Mayo Field advertisers. There are 4 poles available and you have the option of choosing one, two or all four Light Poles. The Rochester Honkers Daily Goose offers you an effective and affordable way to reach your target audience giving you multiple exposures throughout the summer. Your advertisement will be included in every full color game day publication sold during the season as well as those distributed to our Suites, Patio and Media. In the off-season, the publication is used as a sales tool, thus giving year round exposure. The Daily Goose is updated daily and includes, but is not limited to, up-to-date information and statistics about the Honkers, their opponent, league leaders, league standings, and highlights from around the league. Your full panel color ad will appear on 40,000 pocket schedules that will be distributed throughout Rochester and the surrounding communities. Pocket Schedules contain the entire Honkers schedule and game times, promotional schedule, ticket and stadium information. Your logo and message will appear on the backs of all Honker Box Seats OR General Admission Tickets OR Specialty Tickets OR even the backs of the Sports Deck Tickets! Use your message as an advertisement or coupon. Includes one Public Address Announcement at each home game. A minimum of 500 of the item of your choice with your logo, Honkers' logo and media co-sponsor's logo will be given away at YOUR game. Example available items include mini-bats, batting helmets, beach towels, gloves, and t-shirts; the possibilities are virtually endless! The Honkers will secure the media co-sponsor to promote the night via their media at no cost to you. The event will be listed as your night in the pocket schedule, on the website, printed in the Daily Goose, local newspaper and more! Let Honkers fans leave the park with a tangible reminder of your business through product and promotional item giveaways! Make Monday the new Friday! Sponsor a day of the week throughout the entire Honkers' season and let fans know how much you appreciate them! Your day of the week will be listed in the pocket schedule, on the website, mentioned in the Daily Goose, and announced by the public address announcer! Your message creatively read over the Honkers' Public Address system one time each home game (36) in front of a captive audience and relaxed atmosphere. Your ad will rotate throughout the entire Honkers' website for entire calendar year! Add your business logo to the Prize Wheel so fans can spin the wheel in hopes of winning YOUR prize! Not only do they watch YOUR logo spin around and keep them thinking about YOUR business, there are no losers on the Prize Wheel! Everyone is a winner! Stuff the Section with 150 tickets for your friends, co-workers, and/or customers! Your name will appear on the cover of the Daily Goose, in the pocket schedule, and on the Honkers website! You'll also be welcomed over the public address system and on the Honkers radio broadcast. Be sure to ask about a "Honkers Tailgate Party" as well! Click here for more information about Group Tickets! All 72 scheduled games will be streamed online via the Honkers website. Along with the radio, it is also the audio for the video broadcast giving you even more exposure! Pre/Post Game Shows, Starting Line-ups, First Pitch, Call to the Bullpen, Home Runs, Play of the Game, Player of the Game, Stolen Bases, AND MORE!